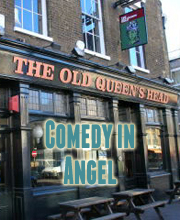 Laugh Out London comedy club presents a whole new comedy experience on Friday December 6 at the Camden Head in Camden. One of our favourite acts, Karl Schultz, will be adorning the wig and glitter of Matthew Kelly to present a talk show of insight and absurdity as he chats to a series of special guests portrayed by some of London’s top comedy talent. Imagine Tonight With Jay Leno but above a pub in Camden. And without Jay Leno. The mind behind probably the greatest show we’ve ever seen at the Fringe. Watch his glue reviews. He stole the show in last year’s Weirdos production of Hook as the baseball-loving Jack. Olympic skiing sensation and World class ladies man. He has broken the hearts of his rivals on the piste, and of a procession of underwear models and Miss Bavarias off it.